Top: the tipper that came with my bodhran. Bottom: the one I bought. I won’t pretend I’m spending a huge amount of time with the bodhran. I do spend a few minutes with it most days, though. 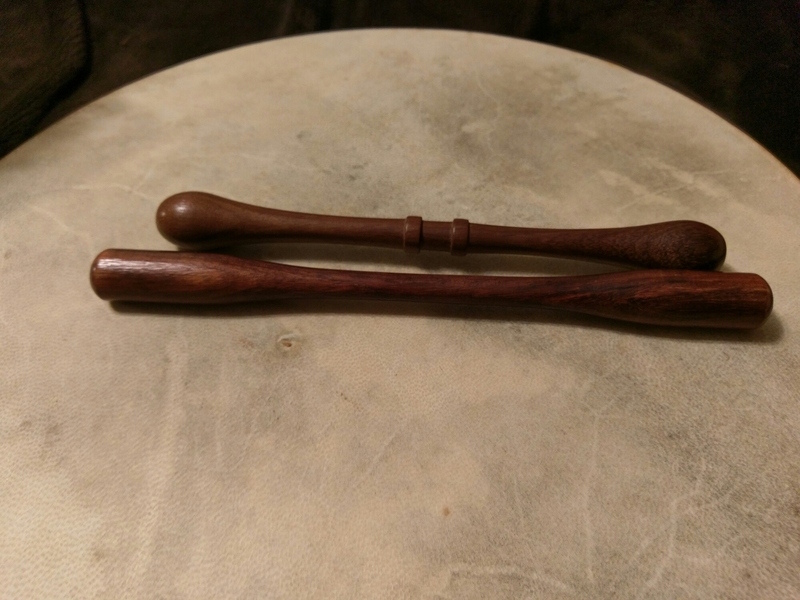 In my last bodhran post, I said I wanted to try a longer, heavier tipper without such a pronounced bump in the middle, as I thought it might have better stability for learning with. So, I spent a good deal of time wandering the internet, mentally cataloged a lot of interesting looking things under ‘for later’, and eventually settled on this one, based partly in cost and mostly on Amazon reviewers describing it as ‘a bit heavy’. As an added bonus, the heavier tipper produces a fuller sound, which I think.I prefer. Does a different tipper magically make me a better player? No, but it makes me a more comfortable one, which means I can practice for slightly longer intervals, so well worth the nine bucks, in the end.